Harmony Fine Arts Grade 4 plans feature Modern (or 20th Century) period art and music. These plans are organized by week and by option. There are three different options for art appreciation and you can do one, two, or all three options depending on your available time and interest. Many families have successfully used these plans with children in grades K-5. I wrote the options so you can pick and choose which activities are appropriate for your particular family. Note that your study of Monet and Debussy will stretch out from week 1 to week 6. Use the link provided to view the painting of the week: Bouquet of Sunflowers (or use the print in the ebook’s Art Print Appendix). Use the link provided to view the painting of the week: Bouquet of Sunflowers. Practice drawing sunflowers using the link provided: How to Draw Sunflowers. View this Oil Pastel Lesson on YouTube. Apply what you learned above and use oil pastels to draw your own sunflower bouquet. You can copy Monet’s painting or use Google images of sunflowers to make your own original artwork. Warm-Up and Relaxation Exercises as outlined in Drawing With Children (pages 66-68). Printable pages are linked to DonnaYoung.org. Choose the appropriate page to print. Complete the Wow! I can Draw! lesson on pages 75-79 in Drawing With Children with markers (step by step tutorial for drawing a bird). Continue completing your Debussy notebook page (included in the ebook) – add some words that you thought of as you listened to his music. 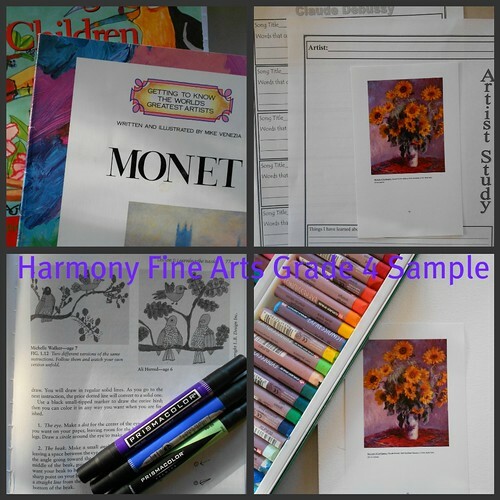 If you have older children, there are also middle school level art and music appreciation plans for Modern Era Art and Music (20th Century) and you can read about them here: Harmony Fine Arts Grade 8 – Modern Era. Please note that Grade 4 and Grade 8 have different artists and composers so they will not “match” except in covering the same time period. If you are interested in studying a different period of art, you can check my Overview Chart for more information about which grade to purchase. There is also a chart for Grades 1-4 listing specific artists and composers included in each year.